Lane Smith is probably best known, by me at least, as the Caldecott-winning illustrator of The Stinky Cheese Man…not to mention the author and illustrator of one of my personal favorites, The Happy Hocky Family. In the past, Smith has dwelt in the sublimely cheeky – bringing his quirky sensibilities to a wide range of offbeat and utterly brilliant children’s books. And while all of his books have had a teensy whiff of sentimentality in them, I never in a million years expected the sheer gorgeousness of his latest book Grandpa Green. In this stunning new book, Smith earns his stripes as an honest-to-goodness storyteller of the highest caliber. Smith’s book tells the story of Grandpa Green, an avid gardener who tells his unforgettable life story in a series of topiaries carved into the shapes of his memories. A first kiss. A war. The cafe where he first met his wife. All are lovingly and painstakingly recreated in the lush foliage of his garden. And his great-grandson, who sees these tales come to life, is the lucky recipient of not only his Grandpa’s artistry but his rich, beautiful life story. Lane Smith has outdone himself in this quiet little book that speaks volumes to the joy of memory. This book goes beyond the normal parameters of children’s literature and into the realm of literary treasures. Grandpa Green wasn’t always a gardener. He was a farmboy and a kid with chickenpox and a soldier and, most of all, an artist. 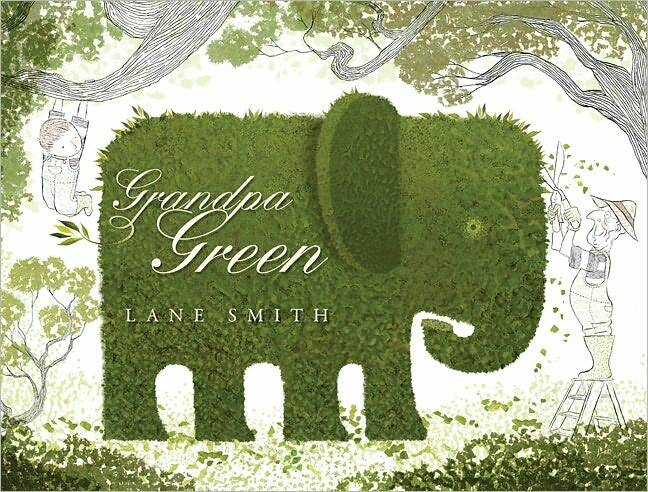 In this captivating new picture book, readers follow Grandpa Green’s great-grandson into a garden he created, a fantastic world where memories are handed down in the fanciful shapes of topiary trees and imagination recreates things forgotten.